So it's safe to say I'm quite clueless when it comes to buying makeup. A) I'm as pale as pale can be, so finding a makeup which doesn't make me look orange is just the most frustrating task & B) with so many products out there, where on earth do you possibly start, it's all well and good people recommending products but everyones skin is so different. Dilemma. Beauty boxes? Ah, genius idea. 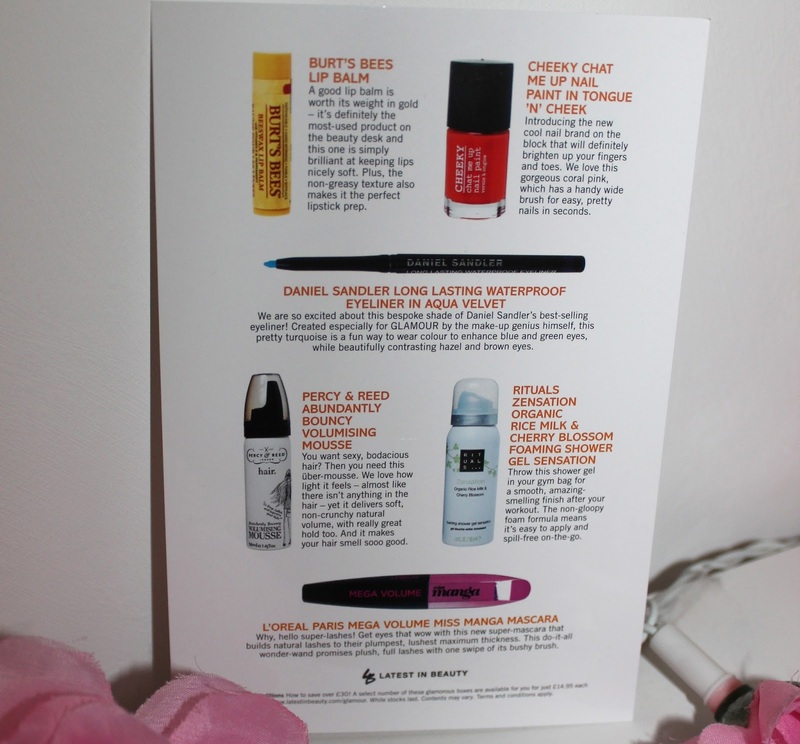 I initially saw the first Latest in Beauty, Glamour Edit beauty box last year, however when I went to buy it was sold out, I can totally understand why as it had some fab items included. Massively regret not buying it sooner. After being won over by the range of products I had seen in the various beauty boxes available not to mention the constant good reviews, I decided to sign up for Birchbox and obviously buy the newest Latest In Beauty, The Glamour Beauty Edit Box. The best thing about these boxes is that you get to try a selection of products which, well you either wouldn't pick up in store, or even bother trying because buying the product in full size and then hating it is never ideal. March is always the best month of course because it's my birthday month, but it was made even better when I saw that Birchbox have collaborated with the iconic brand Lulu Guinness to celebrate their 25th anniversary. This months box included secrets to staying positive, inspiration from the lady herself and of course Lulu's two picks, her favourite eye primer and the stripy candy which inspired her spring collection. Anyone else totally obsessing over her incredible clutches? I haven't got round to trying all the products yet, this is mainly due to the fact that I'm a plain jane throughout the week and more interested in having more sleep than applying makeup plus I'm usually rushing out the door to work, eek. I'm super excited to try the Benefit Stay Don't Stray eye primer and the Nail Rock Manicure Glitter, think i'll save this until I have a party to go to, nice and glam. Obviously, the candy and chocolate will be consumed soon. A little about the products I've tried so far..
LOVE LOVE LOVE it, I'm a bit obsessed with all things blue, aqua, turquoise - yeah you get the jist, yet, I never would have thought of choosing an eyeliner this colour. I apply this to my bottom lash line, having blue/green eyes it makes them look bright and beautiful. It definitely lives up to it's description, glides on and stays put all day. Sadly this mascara let me down, I think it really depends on the type of eyelashes you have as my younger cousin wears this regularly and it looks amazing. I find that I have to use plastic/ rubber style brushes as they separate and define my eyelashes, where as the bristly brushes seem to make my eyes clumpy and disastrous. Round of applause to the person who has invented these hair rings, there's nothing worse than having your hair up all day and not being able to take it down in public because you have a massive kink. The only downside to these is that they are quite bulky and bright blue, I think the bright colours are lovely, although I would have to purchase a more subtle colour. They have a strong grip which stays put, plus the chances of them snapping seem pretty low, which is always a bonus because I must go through hundreds of hair bobbles. I don't often use liquid eyeliner, but when I do the chances of getting both eyes looking the same is just something which I've accepted will probably never happen. Miss Alexa Chung, the queen of eyeliner has been promoting Eyeko recently and I can definitely see why, the felt tip style nib, is the best for creating a precise line with complete control, which is smudge free. I would certainly recommend this if you are a liquid eyeliner fan. Until now, I hadn't heard of CHEEKY, I love discovering new brands and this one seems pretty cool. This is the perfect coral colour for summer, great quality nail varnish and a good coverage with two coats! I've used this product previously, certainly does as it says. Moisturising, natural and smells looovely! A slight tingly feeling due to the peppermint, but not overpowering at all, plus i always think it's actually working if you can feel it, my theory anyway. If you fancy signing up to Birchbox, which I 100% would recommend if you're a beauty product lover, then you can do so here for just £12.95 a month (including P&P) or if you just fancy becoming a member of Latest in Beauty for access to all the fab LIB collections & boxes they have, then here's the link.